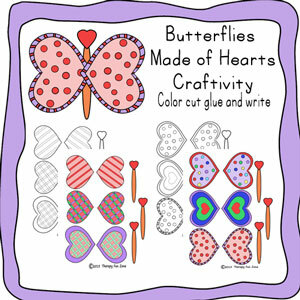 Hearts to color, cut out, and glue together to make butterflies out of. I had the kids glue their butterflies onto my base paper so that they could write at the side of the paper what their favorite thing about valentines day is. Included is the basic white hearts that require coloring, and then there are also some colored hearts in case you want to focus on just the cutting and gluing process.